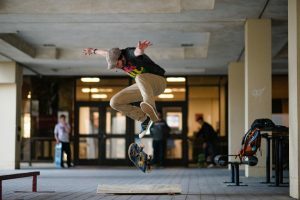 FAIRFAX, Va. – Sampson Carter walked over to the scorer’s table, clenched his fists in celebration and let out a big scream. The No. 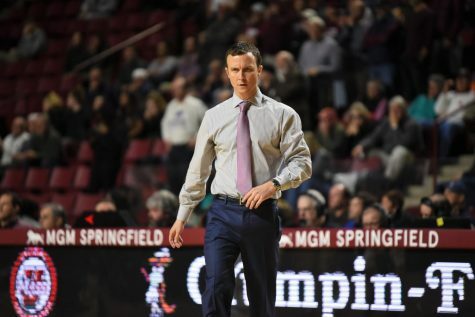 16 Massachusetts men’s basketball team’s latest come-from-behind victory was complete, and it might’ve been the wildest one yet. 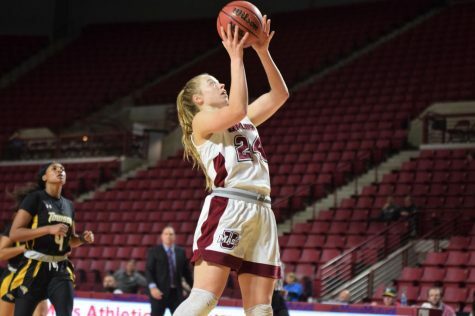 Trailing George Mason by five with 41 seconds left, the Minutemen furiously rallied back, scoring seven points in a matter of 33 seconds to stun the Patriots, 88-87, in front of 4,014 at the Patriot Center on Wednesday night. 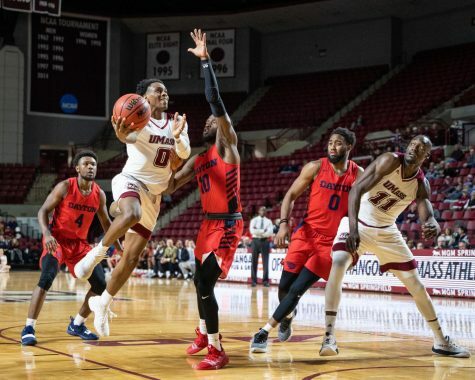 Sherrod Wright made it a five-point game on a pair of free throws with 41 seconds left, but Chaz Williams stormed back the other way for a quick layup to make it 86-83 with 36 seconds left. Bryon Allen made just one of two free throws on the ensuing play to make it a four-point game before Williams cut it back to three by making one of two free throws with 26 seconds left. 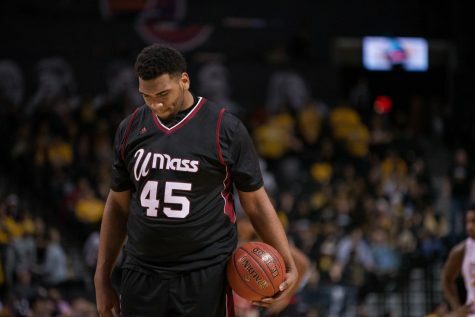 Then, UMass caught a few lucky breaks. 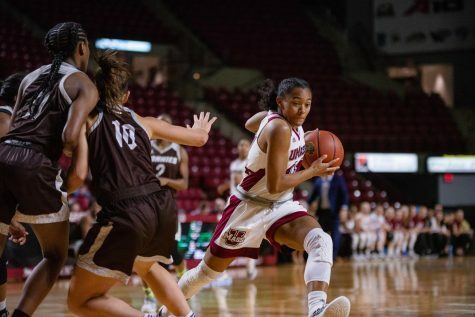 Officials ruled that Wright stepped on the out-of-bounds line on the ensuing inbounds play, giving the ball back to the Minutemen. Williams’ driving layup with 18 seconds left cut the deficit to one, and Kellogg immediately called timeout to set up the press. 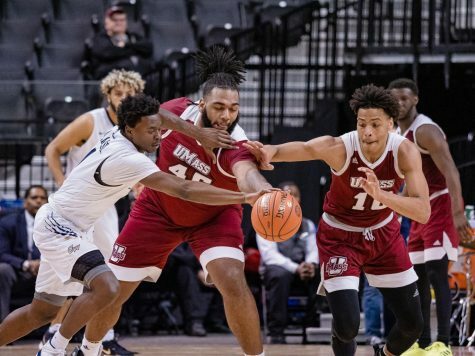 With the clock winding down, UMass opted not to foul and tried to force a turnover. The Minutemen trapped Wright, whose team had no timeouts left, and Williams stripped the ball with 12 seconds to go. In a messy sequence, he finally picked it up and drove into the lane before putting up a wild layup attempt that was off the mark. But just like he was in overtime for the game-winning putback against Providence, Derrick Gordon stood there all alone. The rebound fell into his waiting hands and he put in the game-winner with 8.2 seconds left. George Mason rushed the other way, but Allen was stripped on his way to the basket. Maxie Esho dove on the loose ball and time eventually ran out as the Minutemen escaped in wild fashion. Kellogg, whose team pulled off two come-from-behind victories last week, never quit in his group, even when the odds of coming back looked slim in the final minute. “I’ve always had faith in these guys that all the way to the last buzzer that we had a chance,” Kellogg said. 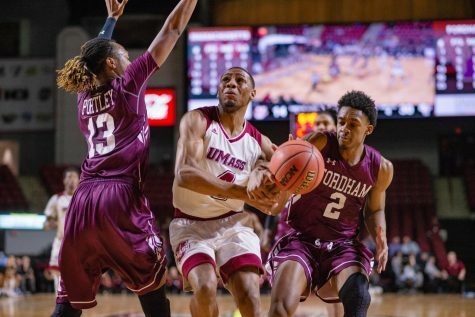 Williams, who led UMass with 26 points and eight assists, said he felt contact on his way to the rim on the game-winning play – “it was the end of the game so they’re not going to call that,” he said – but was glad Gordon was there to clean up the mess. 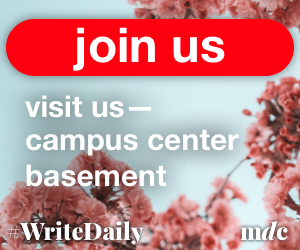 “Luckily DG is always in the right place at the right time,” Williams said. 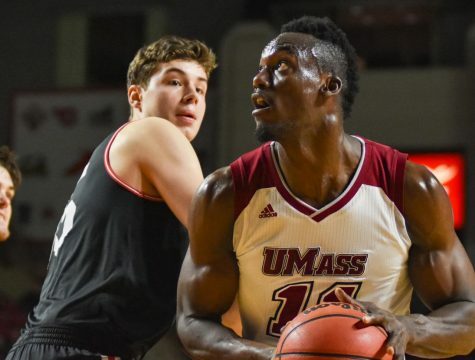 The Minutemen (15-1, 3-0 Atlantic 10) trailed for most of the night. Their deficit was two at halftime before Wright (26 points) scored the Patriots’ first 12 points out of the break to give them a six-point lead. George Mason’s advantage ballooned to as much as eight with 11:38 to go. 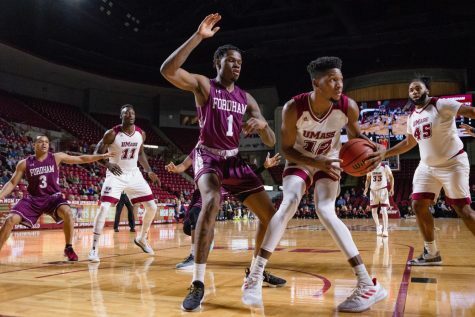 UMass wasn’t fazed by its deficit or an opposing crowd that seemed to get louder and louder as the game wore on, though. The Minutemen went on a 9-1 scoring run to tie the game at 68 with 8:08 left. The Patriots didn’t score a field goal from the 13:51 mark to the 7:08 mark, when Johnny Williams’ and-one gave them back the lead. “We went to a zone there for a little while,” Kellogg said. “We just needed to. They had our man-to-man defense figured out to a certain extent, they were driving us into the paint. They were making some tough shots and I wanted to change up the flow of the game a tad just to see if we could slow them down some. 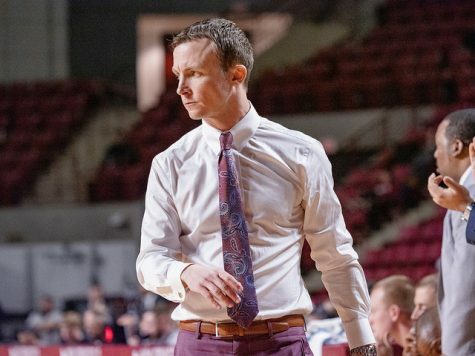 The win was the 100th career victory for Kellogg, who started his coaching career as an assistant at George Mason from 1997 to 1999. Considering his team’s recent knack for the dramatic, chances are there won’t be many more victories as fitting as this one. “That was one of the more special wins I’ve had as a coach,” he said.